Happy Fourth of July! Or as it is also commonly referred to, Independence Day! And what is more of a symbol of independence than an alien standing in an airport before getting on a ship that will change his life forever? 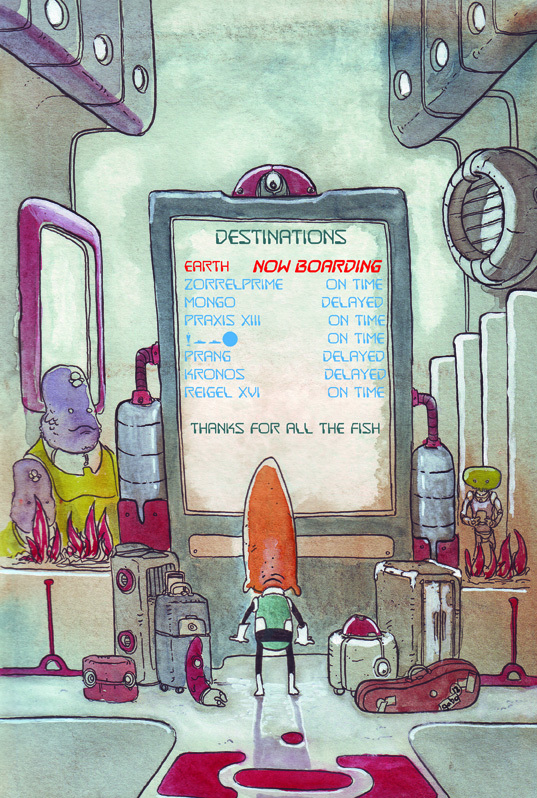 Before we launched Albert the Alien as a webcomic series I commissioned Gabe to do this poster – an image of Albert in front of an alien boarding screen, running late for his trip to Earth. I absolutely love this image of Albert. It gives us a taste of how different – and yet how similar – life in space would be for an alien society. We see Albert with all of his off-worldly possessions. At some point I may write an issue 0 where we show Albert and Gerty’s lives before our adventures begin, but that would be a ways off. – Mongo is the planet Ming is from in the series Flash Gordon. We also have a character in Albert the Alien named Ming, who is the vice principal. Don’t worry, he’s not an alien though. – Praxis XIII I think may be a reference to Star Trek…? – Thanks for All The Fish – is a line from The Hitchhiker’s Guide to the Galaxy. It’s the last thing the dolphins say to human before abandoning the planet. I was also thinking of putting in another famous line from the book, “Don’t Panic,” but I didn’t feel that was appropriate at an airport. Although it would have been relevant for Albert, since he’s late for his flight in this picture. What kind of sci-fi series do you enjoy? Books, video games, movies, TV shows? Tell us about it in the comments, and we’ll see you next week!